A Quechee Inn Wedding takes place before a backdrop of the Ottauquechee River, historic red barns, and lush green meadows. Built in 1793, the Quechee Inn is a historic residence that was originally the home of Colonel Joseph March, Vermont’s first lieutenant governor. The inn has since become a prime Vermont wedding location with delicious cuisine and an exceptional, friendly staff. At the inn, couples can enjoy a classic Vermont wedding regardless of the season. This Quechee Inn Wedding took place in the fall. Fall weddings in Vermont are truly something to behold. As can be seen in this image, the colors of the season have begun to take the stage, adding shades of red and orange to the scene. The newlyweds stand beneath a tree and share a gentle kiss away from the celebrations. 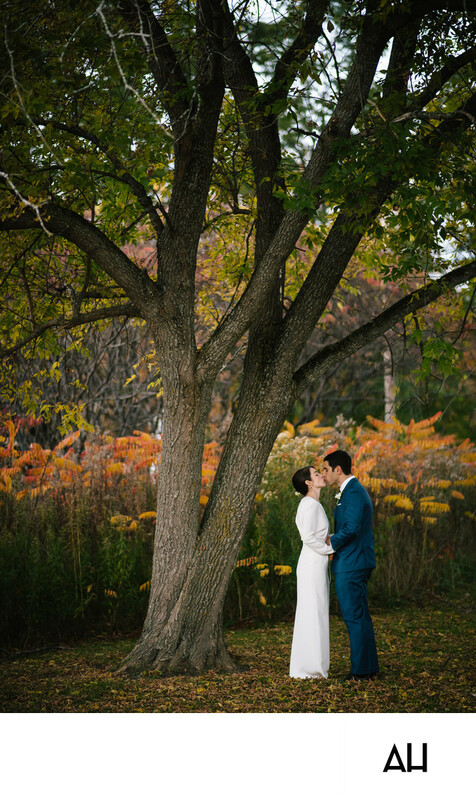 The bride and groom stand out against the autumn hued flora in the background of the photograph. The bride’s A-line gown is conservative with long sleeves and a high neck, but it is also incredibly unique and stylish. The stark white of the bride’s dress contrasts beautifully with her dark hair and the Navy of the groom’s suit. The groom leans down toward the bride, as they gently brush lips, and revel in this new chapter of their relationship. The pair hold hands as they bask in this quiet, peaceful moment together, a time to simply enjoy the day and the feeling of being newly married. The only sound being the whisper of the wind in the trees and the rustle of the leaves at their feet. It is a portrait of love and union, set in the tranquility of nature.